Responding to questions re my wage oped. I’ve got a piece in the NYT on the cyclical, and more importantly, structural factors, that have long suppressed real wage gains. I’ve gotten many interesting responses, some of which I’ll address here. Inflation: As I stressed in the piece, the ups and downs in price movements have been instrumental in recent years. A lot of this is energy prices, which crashed in 2015 and have picked up of late. If energy prices pull back, especially as unemployment falls further, real working-class pay should get a boost. But the concerns I stress in the piece, especially the collision of stronger institutional and corporate anti-worker forces with weaker pro-worker forces, are robust to a short periods of real gains. This raises another good question I got, which I’ll tackle below: what is it you’re looking for here? Surely, a few months of real gains don’t mean workers are in the clear, but how will we know if these punishing dynamics have turned? Someone suggested that I shouldn’t use the CPI deflator in the piece. One of the benefits of doing so is that’s what BLS uses, so my findings link up with what’s being reported. The CPI is also the most reliable way to track consumer prices, except for it’s not chained (look up chain-weighting if you’re interested). Aside from that, I agree with the Mishel/Bivens discussion here on why the CPI is preferable to the PCE for deflating wages. However, there is a chain-weighted CPI since 2000 (CPI-C), and it runs about 0.3% cooler, year/year, then the unchained version, meaning that’s how much faster real values grow if deflated by the CPI-C, on average. That said, using the unchained CPI shows the working-class real hourly wage up 0.5% since 2016 while using CPI-C returns 0.8%. So, pretty much the same story. Some of this may invoke this debate among Democrats about the electoral wisdom of “moving to the left.” I don’t see the problem (neither does EJ Dionne, in this highly resonant piece). It seems obvious to me that something big has got to give is we’re to get back to Factville, representative government, and the reestablishment of durable linkages between overall growth and broadly shared prosperity. What does success look like? My piece suggests that if paychecks mete out some cyclical gains before the next downturn, that won’t be enough to reset the structural power imbalances I emphasize. So, some folks wanted to know what would success in this space look like. I’d like to see median and low-wages grow at around the rate of productivity throughout the cycle. For some workers in low value-added sectors and jobs, that criterion shifts to “after-tax and transfer” wages/incomes, especially if they’re parents. But closing the gap you see below strikes me as the right goal. What about technological change as a factor driving wage stagnation? Does my focus on power dynamics mean I don’t think the SBTC (skill-biased technical change) is that important? SBTC is the idea that wage inequality is a function of a shortfall in the labor supply of highly skilled, technically adept workers (given employers’ demands) relative to an oversupply of less-skilled workers. In a way, it’s a more benign explanation, though even if it’s right, certainly power dynamics dictate who gets access to the high-demand skills. But SBTC certainly doesn’t link up with the cyclical part of my story. If the job market is so damned tight and labor shortages are so damn binding, then employers should be bidding wages up more than we’re seeing. As far as structural dynamics, skill demands are in the mix, for sure, but as best I can tell, they’re a relative steady force over the past few decades, whereas the anti-worker institutional forces seem to me to accelerating. Increased firm concentration, the increased attacks on unions, the growing corporate tilt of the courts, the rise of arms-length employment relationships and wage-suppression measures like anti-poaching rules—my guess is that these are increasingly determinant of economic outcomes relative to SBTC. Share the post "Responding to questions re my wage oped." 3 comments in reply to "Responding to questions re my wage oped." 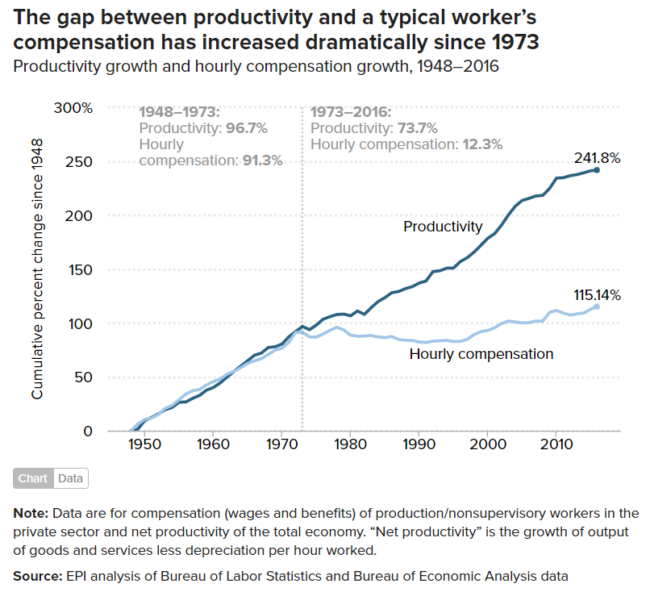 Wages have to grow *above* productivity. There needs to be some redistribution from capital to labor, and the only way to do this is to have wages grow faster than capital. The real problem is the phantom menace of labor shortages AS A BAD THING. Labor shortages are the mechanism that raises wages in the standard Marshallian supply-demand analysis. The Chamber of Commerce is always warning about it, but it never materializes. It used to be that Democrats liked labor shortages. (Actually, Chuck Schumer, for example, still does. But the thing living at the base of his brain, that will have to find a new host when he dies, is in league with the Chamber of Commerce.) (Satire doesn’t violate the mensch rule.) But now the Dems (or the things at the base of their skulls), start to worry about labor shortages being an emergency. Actually, the last time it was an emergency was in early 1945. Eisenhower was screaming for more infantry (a very specialized skill set) and the war plants wanted more workers. More men and weapons than the enemy has. But in peace time, labor shortages only raise wages. That’s only an emergency to people who don’t want to pay higher ages. If technological change and trade reduce labor demand (a couple of big ifs) then immigration isn’t necessary. Immigration just aggravates the problem. If this administration ever got serious about using e-verify and making sure that no one could work without an honest Social Security number, wages would go up. Now the best argument that immigration doesn’t depress wages is never to mention it when writing about the other problems of American workers. Some progressive economists claim that they have seen studies showing that immigration raises wages, but they never give the citations, including the make, model, and tag number of the car with the bumper sticker. I use a 3 year moving average of the cpi as a measure of inflation expectations and it works very well in my wage equation.